Are you getting frequent patient requests for medical excuses from work due to headaches or “stress”? Many sick leave policies require a doctor’s excuse. Repeated requests may be a sign that your patient has a problem with alcohol or drugs which contributes to the 500 million workdays lost annually at a cost of $81 billion. Is your male patient engaging in social activities, like excessive drinking, that are compromising treatment of his medical condition? Many medical conditions can be exacerbated by heavy alcohol/drug use or abuse. If treatment of a patient’s condition such as hypertension or diabetes is not progressing as it should, you may want to ask the patient about his alcohol/drug use and introduce the idea of outpatient alcohol rehab. Can you help a patient you suspect may have a drinking/drug problem & denies it? Addiction is defined as something one cannot stop despite the presence/evidence of negative consequences. Often individuals will not agree to a period of abstinence to find out if drinking is a problem. When denial is this strong, there is little anyone else can do. Asking your patient to answer a self-assessment questionnaire may help break denial. Until your patient sees there is a problem, it is best to maintain a nonjudgmental attitude. How helpful are the new medications for alcohol and drug dependency? Clients with a chronic relapse history may benefit from medication to reduce cravings while in treatment and for a short period thereafter. Our clinical director may recommend that an admitting client receive an evaluation from our Medical Consultant, a board certified member of the American Society of Addiction Medicine. He is also available for doctor to doctor consults. 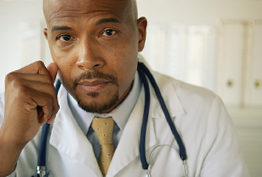 If your patient is interested in finding out if he has a problem, what’s a next step? Many find help right away through participation in Alcoholics Anonymous or a similar 12-step program. Others, however, need the structure, support, and education they and their family receive in addiction treatment facilities. Referring your patient to an addiction treatment center for a free, confidential assessment is a sound next step.